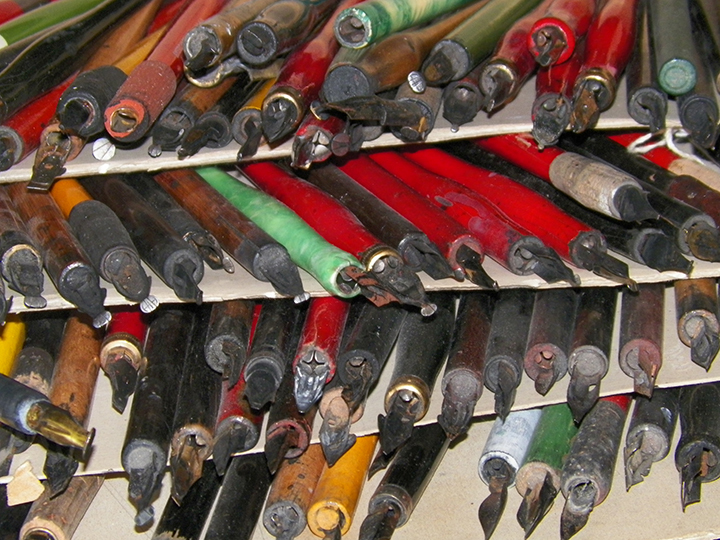 I am extremely excited to formally announce that I am nearing the production phase of a new book about William H. Gordon and Ross F. George, inventors of the Speedball line of lettering pens. Publishing agreements have been worked out, the contracts have been signed, and the bulk of the research and writing have been done. Over the coming months I will be privileged to work with a top designer, editor and publisher on the updating, revision, editing and design of a book that promises to be one of the most important projects of my days on this earth. The reasons why things happen have always fascinated me. Ross F. George was a lettering artist born into a particular type of world in a particular age that affected his attitudes, goals, desires and means. Putting his history into a context that explains what was happening around him both locally and from a global perspective seems vital to understanding not only how, but why the Speedball history came to be. 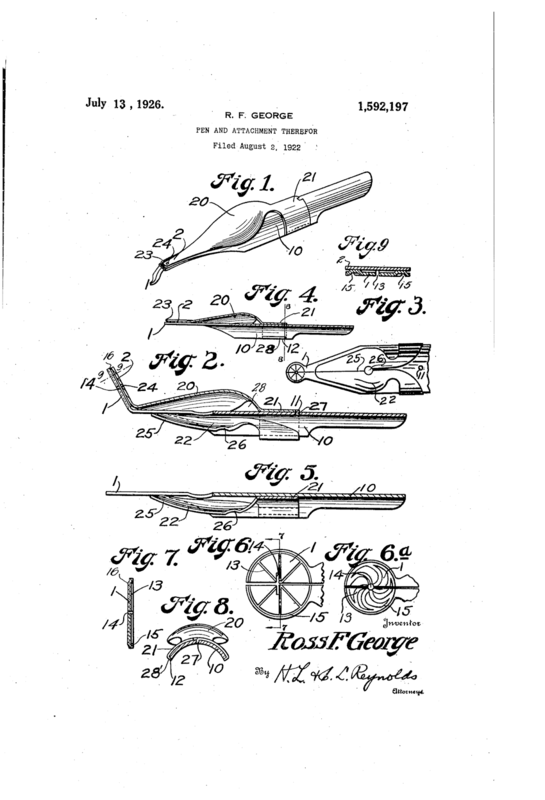 In the early 1900’s, Ross F. George and William Hugh Gordon invented the Speedball Pen, a tool that played a revolutionary part in commercial lettering in the 20th century. Both Gordon and George, to date, have been enigmatic in history. While both have written books, little has been written or really is known today about their lives. For Ross George, even the best histories that have been written, such as those by nationally recognized sign-man and designer Mark Oatis[i] and more recently by Seattle historian Peter Blecha[ii], are extremely enlightening but are also only able to provide an incomplete outline of his life and work. Seattle native and renowned graphic designer Art Chantry complains that there is frustratingly incomplete information about George’s life and his role in the lettering culture which led to the invention of the Speedball pen[iii]. Up until now, the information simply wasn’t there to be found. When I was asked to be the editor of the Centennial Edition of The Speedball Textbook, I was extremely interested in finding out more about this history. Through friend and lettering colleague Carl Rohrs, I was able to contact sign-man Lee Littlewood in Portland OR, who had recently purchased an original artifact of a Ross George show card display. Through Lee in turn, I was able to contact his antique dealer who kindly passed my information on to Ross George’s granddaughter. Sue George Yourkowski, was the family member responsible for clearing the estate of her aunt Frances George, Ross’ daughter, in 2011. During Frances Georges’ lifetime, when Sue would visit she would ask: “Aunt Frances, can I see some of grandfather’s stuff? Just his pens or something? Each time she received a reply to the effect of “no dear, they’re really not easy to get to”. In the basement of the Seattle home, Sue Yourkowski spent 6 weeks going through material and deciding what to dispose of and what to keep. Frances George was an accomplished musical vocalist, and the basement was piled high with sheet music, newspaper clippings and memorabilia. Stacks of it. Piled high. Covering tables and shelves, spilling over onto the floor and kept in file boxes. So much so that it was virtually impossible to walk from the entrance to the basement to the other side. While one might hesitate to use the word hoarder, it would be safe to say that Frances was loathe to throw anything out. In a scene that could have come right out of a movie, Sue woke up one morning with a presentiment and visualization of exactly where her grandfather’s box of pens lie in the basement. The next day she went to the house, spent almost half a day clearing a path, and reached the corner that she had seen in her dream. There she found the pens. There was his apron, paint smeared and untouched just as he had left it the last time he used it. And, as she continued to clear the stacks of papers, Mrs. Yourkowski found the archives of Ross George’s work. Inside his drawing table and stacked on it’s surface. 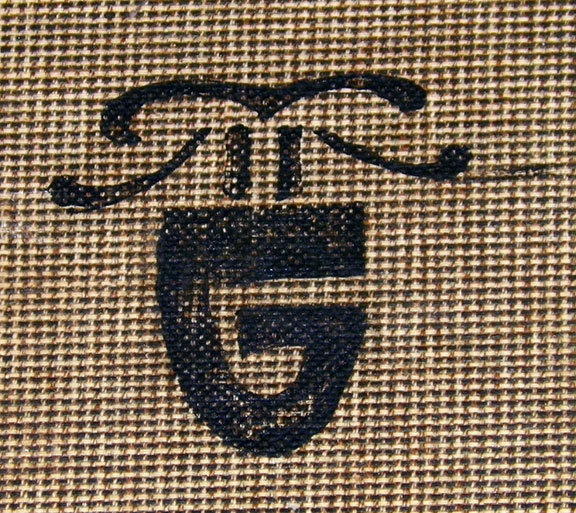 Original lettering. Show cards and shop samples, alphabet exemplars, prototypes of copybooks, and samples of early Speedball Textbooks. There were 14 X 18” cards and 2 albums full of beautiful Art Nouveau patterns and designs executed in pen and ink and watercolors. She found dozens of cards with original lettering, alphabets touched up for reproduction or pasted up in layout form with notes and page numbers – the original work that appeared in the textbooks themselves from as early as 1918. All of it kept in pristine condition because of all the music sheets and paper stacked on top of it. God bless Frances George. Perhaps even more important were the personal archives. Birth certificates, marriage certificates, newspaper clippings and copies of articles written about Ross George. There were family photo albums complete with grandparents, parents, siblings and other family members dating back to the late 1800’s, photo albums of Ross’s time with The Mountaineers in Seattle, and photo albums that contained pictures of the early sign shops complete with partners and colleagues from the show card era of the early 1900’s. 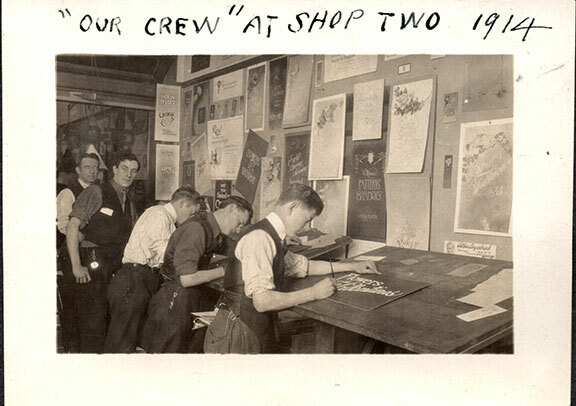 Notes written on the pages next to these photos identified such people, places and events as “first ever show card done with a Speedball Pen” or “Shop 2, 1914”. Ross’ wife Eva had kept a personal account book of all his inventions and patents, with business and family expenses and income; that book was there. And most importantly, there were personal typed documents and specific articles telling the story of the Speedball pen and how it was invented. Mrs Yourkowski was kind enough to allow me to come and spend time at her home, interviewing her and creating a digital archive of the work that spawned a textbook that became a part of the fabric of American lettering in the 20th century. From this base I have been able to find and follow the ensuing rabbit trails that have led to over 50 articles written by William Hugh Gordon and later Ross F. George. This material has provided clarification and confirmation in the case of Ross George, and vial clues that have led to a path to research into the life of William Gordon. 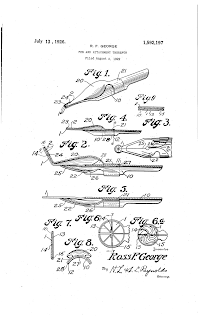 Perhaps at last we can get a little glimpse into the life of William Gordon and Ross George, men from an era when American invention and innovation was prevalent. They created a pen that solved a problem that created a following that has lasted a century, continuing into the 21st century with the updated 24th “Centennial” edition of his Speedball Textbook. 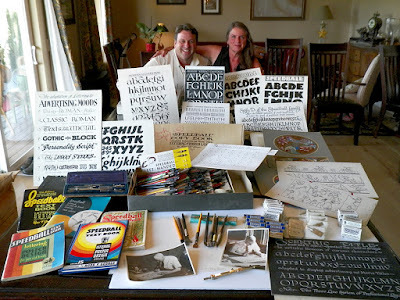 Over the coming months I will be privileged to work with Designer, art director and editor Norman Hathaway and publisher Rob Saunders of the Letterform Archive to bring the story of Gordon and George and the invention of the Speedball pen into book form. The first ten chapters have been already written and there are a few more to go, but we are well on our way to a deadline of December 2016 with publication expected in 2018. Please stay tuned for more details as the process continues! [i] Oatis, M. (n.d.). 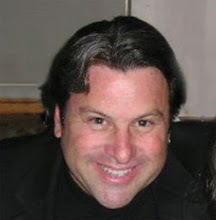 Ross F. George (C. Rohrs, Ed.). Alphabet: The Journal of the Friends of Calligraphy, 17(2), 2-13. [iii] Chantry, A., & Rochester, M. (2015). 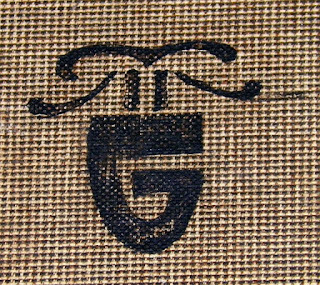 Ross F. George: Typographic Man of Mystery. In Art Chantry speaks: A heretic's history of 20th century graphic design. Port Townsend, WA: Feral House. This is fascinating, Randall! So eager to see the book when it comes out! Some of the personalities are unheard or have vanished along with the past. But revamping those and bringing them back alive is more important.